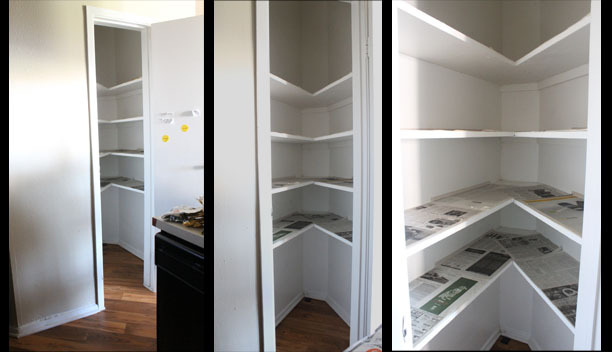 I couldn't even click the "BEFORE" photo, the pantry was such a disaster. Super, super lazy me - just don't get around doing something until I just can't take it anymore. But finally I decided it was high time I cleaned the pantry. 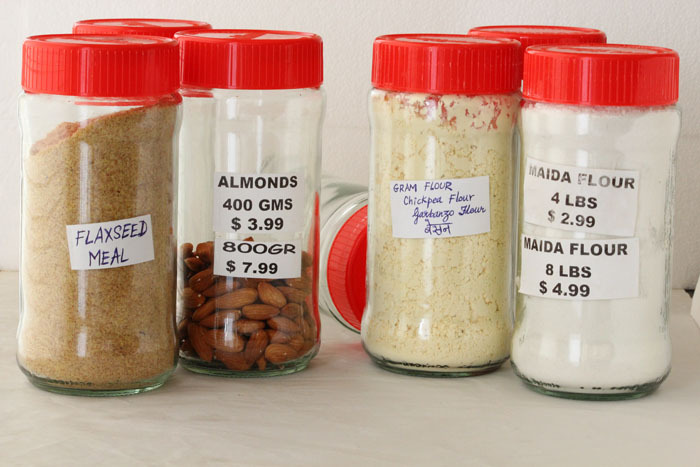 Time to refill partly empty bottles, throw away unnecessary packets, make a list of items needed to be restocked, sort out everything, and use the space efficiently. Zoomed in, the pantry looks big. But it's actually a weird triangle-shaped small closet. Such bad layout, shame. But at least with the left and right sections, I divide the food items accordingly. All lentils on the right hand side, all spices and flours on the left, etc. I am picky, and couldn't find a set of reasonably-priced transparent canisters the kind of size, shape, height, weight, and width I wanted. 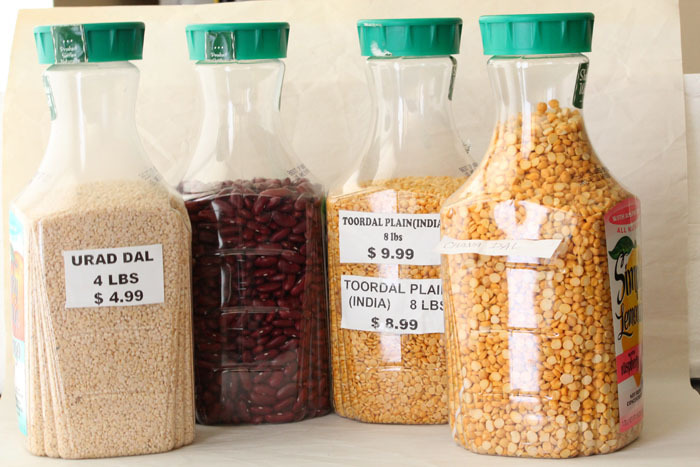 So I used these Simply Juice bottles to store the lentils. Though plastic, they're quite durable, hold good enough quantity, lightweight, see-through, slender, tall and don't take up too much space. At least temporarily, I could do with them. 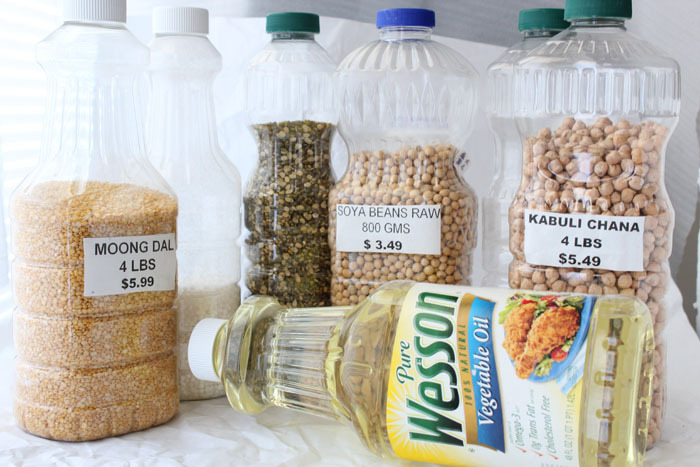 The same goes for these oil bottles. A $3 bottle of juice and a $3 bottle oil that, instead of throwing away when empty, you can reuse to store a lot of your lentils and other pantry items consistently. Now multiply it and see how much you can save? I used to drink a lot of Ovaltine earlier. Each glass bottle added a colorful touch to my pantry. I love red. Because we lived in a small apartment temporarily and knew we had to move soon, I didn't want to purchase too many bottles and canisters that I might have to throw away when moving out. So I used up every possible bottle to store every possible item. 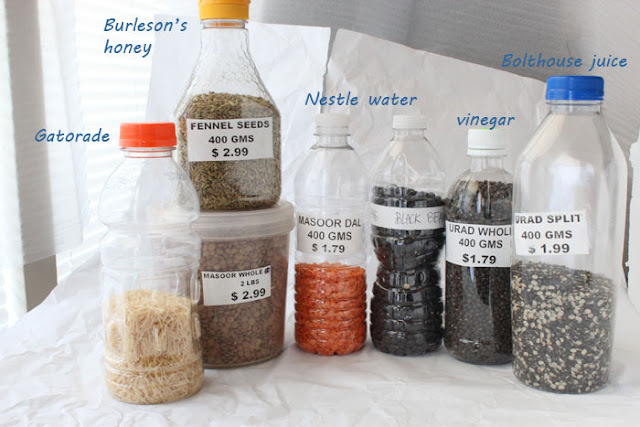 More interesting ideas to reuse, recycle, and repurpose stuff at home. My younger sister studying in UK and living alone thought the idea of reusing the water bottles for her to store the small amounts of lentils and spices was good. 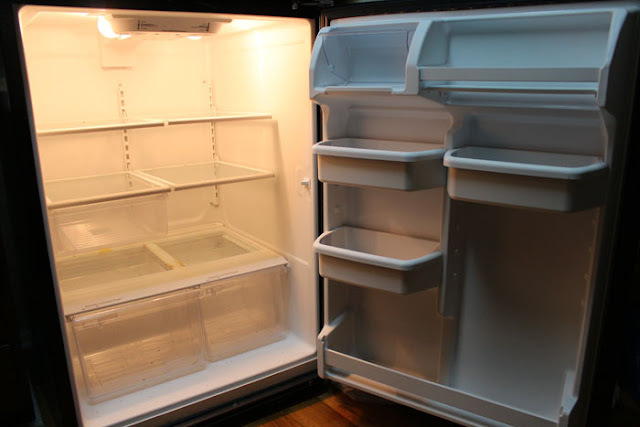 Singles, students, and those who don't want to spend too much on containers from stores can definitely make use of these things. By now you may have noticed name, quantity, and price on some containers. I cut out that part from the packet of the grocery item and tape it to the bottle. I have a bad memory in remembering how much something costs. When I see something needs to be restocked, if I find it on sale or at a similar price, I buy it. Otherwise, you see the raw peanuts bottle? The same 4 lbs with $4 difference. This might not be a big deal to someone else. But since I'm not earning, I try saving up by shopping smart, and even using coupons, deals, and price matching. Excellent and well organised, am yet to clean my pantry. Always we get lazy and dump our work once when we have mood esp.. I :). Well orgainised. hehe, i know, i'm so lazy too! your pantry looks nice, Don't use newspaper as after some time there will stains from the ink.s. you're right, the newspaper did leave stains. back home i had always seen newspapers in kitchen cabinets so i did the same, but the paints they use in some apartments US cause newspaper to stick & leave prints. Agree with the prev comment - newspaper will stain after a while. You can get shelf liners for less at Big Lots! Try it. Also, resuing the water bottles may be ok temporarily, but try avoiding it over the long term. They are made for one-time use and are not meant to be reused. You never know whats leaching into your food! Didn't want to spend too much on shelf and drawer liners at that time so used newspapers and plastic bag cutouts. But am definitely going to use better, proper liners in the next nicer apartment I move to. Thanks, will check out Big Lots; haven't been there yet. You're right. But since I was not heating, freezing, or storing liquids in the water bottle - only dry lentils in the pantry unaffected by any temperature changes - I believed it was okay to reuse. Will read up more if storing dry stuff in the plastic bottles is harmful too. 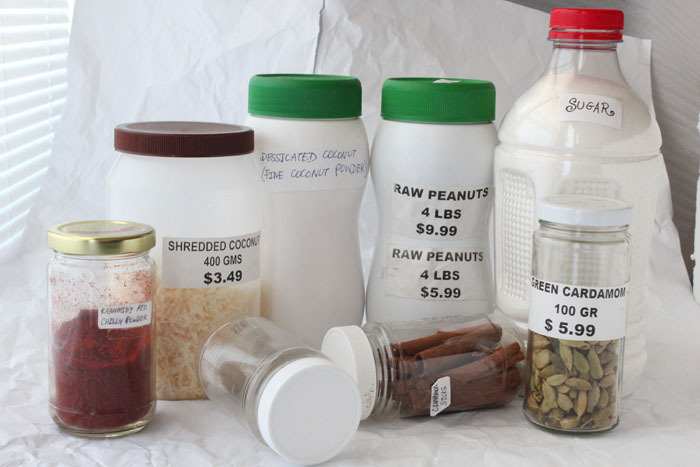 I commend you on reusing your old bottles and containers for storing food. I just cleaned up my whole kitchen top to bottom yesterday... Now I'm feeling like I'm gonna fall ill due to over exertion. I too use to reuse plastic containers but no more... I'd rather be safe than sorry. My recent favourites are nutella and dabur honey glass jars... I do have plastic food grade storage containers which I hope to eventually replace with glass. I purposely don't buy a lot of food so that I don't have to clean the pantry too often. I wish I was kidding! 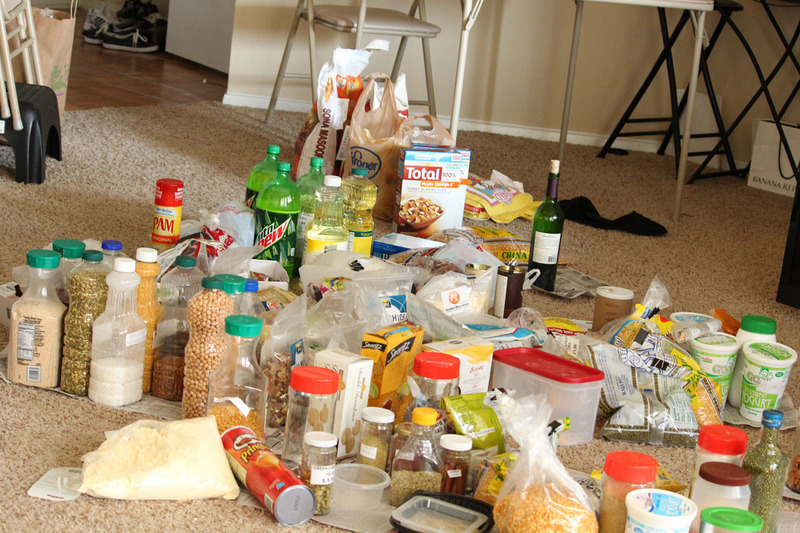 Joe and I just cleaned our pantry last week (well, mostly Joe since he does the cooking). We found so much expired stuff. We were forced to do it to make room for baby food:-). Well worth the effort. Looks like you've got a good system going! Great Work Nisha, We are moving soon to company accomodation, so I also have to something about my Kitchen and pantry, waiting for my Hubbys off-duty days. I use palstic juice bottles and milk bottles. I think you can find the durability of the bottle will depend upon the type of plastic it is made from. There is some sort of mark identifying the type of plastic at the bottom of the bottle, it is a requirement in most countries, so you can find whether the item can be safely stored in it or not. Anyways, I think there is more chance of leaching chemicals only if you store hot or warm items in Plastic. For people with small children at home and elderly people with shaky hands and poor reflexes, glass also has its potential problems. As I am expecting a baby, I am also expecting to be sleep deprived and hence a little more clumsy, so I am replacing my glass nutella bottles with Plastic Boost bottles. I try to use milk and diary products bottles since I figure that they undergo pasteurisation and have already gone through high temperature. One more advantage of these are that once they get greasy from the kitchen atmosphere, throw them away and use a replacement. No more soaking and washing bought containers. Love your official looking labels, I just use a permanent market and my best handwriting (as neatly as my mood at that time). aah reading the post i feel it's time my pantry gets the well deserved attention. I agree with not reusing the water bottles. It may be dry lentils but like you say the change in the temperature of the kitchen might work with the ingredients inside the bottle. Also, while transferring/refilling the bottles and jars , I cut the label of the pack and stick it on the bottle instead of using/wasting papers or stick on's . I also make sure to cut the the expiry date of the product. This enables me to plan better. This is so cool.. reminds me of my school/college days when we 4 girls shared an apartment and were on tight budgets..
My hubby was (still is - just not as much) big time Complan drinker - I know.. still a growing kid.. haha.. but then complan used to come on glass container and he/I saved those containers for same storing purpose. When we moved to our new home, I didn't have to worry about buying storage container as those bottles worked perfectly in my pantry. All are labeled now with ingredients for the days when hubby feels like experimenting in the kitchen.. I was still salvaging bottles/containers till few months ago when things started getting out of hand - so to speak. Then decided to keep similar looking containers and throw odd-man out.. lol..